Description: Westbound Panorama train 105 arrives at Capreol with the 6789 leading an all MLW consist. Note the two different style number boards on the 6789. Many hours late train 202 sits on track 2. Description: CN 6789 and 6633 power up as they get the 9 cars of train 45 accelerating out of Kingston, Ontario on May 21st, 1980. Description: CN 6789 leads the 1998 Christmas Special eastbound into Decatur at Wabic Interlocking. Description: CN 6789 rests between runs at the Monticello Railway Museum. Description: 6789 is basking in the sun in the Camp Creek Yard. Description: CN 6789 heads into the yard for the night. Description: CN 6789 and CN 6862 are ready to depart Nelson Crossing for the Downtown Monticello Depot. Description: CN 6789 leads a train into Downtown Monticello during the Monticello Railroad Museums' Railroad Days. Description: On a rainy June day, CN 6789 (privately owned?) 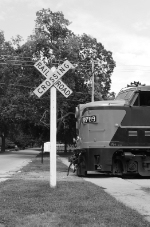 pulls a museum train near the Nelsons Crossing depot. Description: CN 6789 gets prepared for the days's runs at Monticello. 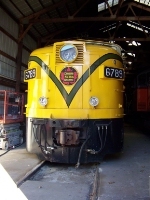 Description: CN 6789 sits in the engine house at Monticello. Description: MLW FPA-4 rolling through neighborhood near downtown Monticello. Description: Unit from the Monticello Rail Museum on the way to downtown Monticello. Description: CN 6789 pulls into the depot at Nelson's Crossing in Monticello, Illinois. Description: Nose of FPA-4 with classic CN maple leaf logo. Description: Engineer Steve checks for all clear before moving CN 6789. 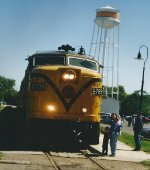 Description: CN 6789 at the Wabash Depot in downtown Monticello, Illinois. Description: CN 6789 moves up to the shops at the end of a day's service. This FPA-4 will be put indoors for the evening. Description: Steve waits patiently for passengers to board. This unit was built in 1959. Description: Waiting for passengers at the Wabash Depot in downtown Monticello. Description: CN 6789 at the downtown depot during the 2008's Railroad Days.